Violet has every intention to hightail it back to Chicago, but then a dead man is discovered clutching a volume of Emily Dickinson’s poems from Grandma Daisy’s shop. The victim is Benedict Raisin, who recently put Grandma Daisy in his will, making her a prime suspect. Now, with the help of a tuxedo cat named Emerson, Violet will have to find a killer to keep Grandma from getting booked for good..."
I enjoyed this book so much! It was just such a fun read that had me laughing out loud on multiple occasions. I've had this book on my TBR list for over two years which is a shame considering how much I enjoyed it. But that's what happens sometimes, and I won't be waiting that long to pick up the next book in this series! In this book, Violet gets drawn into a murder investigation because her grandmother is considered to be the prime suspect. One of the things that caused me to hesitate a bit with picking this book up at first was the idea of a magical bookstore. 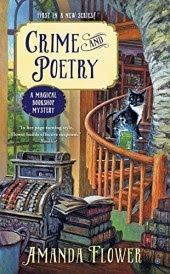 I'm here for any and all cozy mysteries set in bookstores but I wasn't sure how the author was going to work a magical bookstore. She did it beautifully though and in a way that just fit in perfectly with the story. What could have been over the top just seemed to fit perfectly. I really loved everything about this book! It was a fun read and kept me guessing throughout. I also really, really enjoyed that the author included some pieces of history in the book. I don't want to say more than that as I feel like it is a slight spoiler. Overall, I really enjoyed this book and am left very excited to have finally tried this cozy mystery series. I've got two more books now to look forward to which is always a good thing! I'm glad that my personal TBR challenge finally gave me the push I needed to read this book. It was a great way to start off this challenge for me in 2019 even if it added more books to my TBR rather than lessening it. What a great problem to have! I would recommend this book to fans of cozy mysteries and mysteries alike. It was a really fun read so I hope that other readers enjoy this one as much as I did! Bottom Line: A fun beginning to this cozy mystery series! I can't wait to read more! Disclosure: I read this book courtesy of my local library. Thoughts as always are my own. I have this one on my TBR pile and really need to make time for it. I am glad you liked it so much, Sam. I need to consider this one, though cozies are still not my favorite type of mystery right now. Anyway, I love magical touches though....will keep it in mind. Oh I'm so excited to see how much you enjoyed this! I discovered I have this doing a mass reorganization the other day and remembered how much I want to read this when it came out. It sounds like it lives up to its promise!